The ladies team from Wotton-under-Edge Hockey Club unveiled their new playing strip recently, thanks to help from a generous sponsor. RC Autos of Charfield - who specialise in servicing and bodywork - agreed to sponsor the new strip in the club’s traditional colours of Royal Blue, which will be worn in games across the region in the coming season. 2006/07 represents an enormous step forward for the club with the ladies XI entering the league structure for the first time. Progress of the ladies team from its original formation to this point has been remarkable and is largely down to the enthusiasm and commitment of the players themselves. 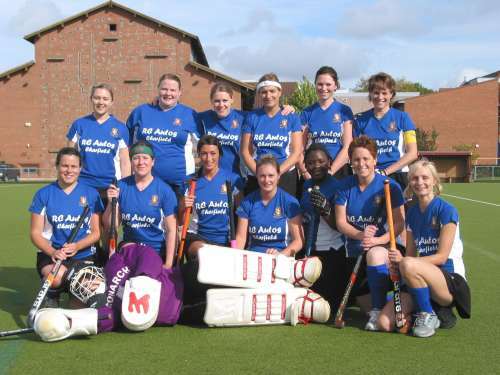 The ladies line up in Severn Division 3 of the West Women's Hockey League, playing regularly on Saturdays. The team now have a regular training slot at 7.30-9.00 on Tuesday nights at Castle School, Thornbury and are always keen to hear from new players. Mark Davies, proprietor of RC Autos, commented: "We are proud to be associated with Wotton hockey club and their ladies team at this exciting stage of their development, we wish them every success for the season ahead." Club Secretary Stuart Emms added: "Wotton-under-Edge HC welcomes the chance to work with local businesses or community groups, and is always happy to hear from potential new sponsors." For more information about RC Autos' range of services, please contact Mark Davies and his team on 01453-844642 or call in on their premises at Charfield New Mills estate.